If you did not know I am a very organized person. But they also like to ask me how to organize certain things. One thing I have been asked about repeatedly is how I keep papers organized. You know things like bills, policies, medical records, etc. A new paper comes in. It will go into a letter tray to be paid or to a file box to be stored. Once the bills are paid they go to the file box as well. They will stay in the file box for a year. Once the year is up they get transferred to a three ring binder. They stay in the three binder for three years, five years, forever. However long I feel necessary. Once there time has passed the papers are shredded. The letter tray is stored on my desk. The file boxes on a book shelf. The binders in the closet. Each three ring binder is a different color and is assigned a specific topic. Red for Medical. Bills, health insurance. Orange for our Cable Provider. Bills, our contract, contact information. Yellow for Scout. Mainly his medical records. Green for Finances. Bank statements. Blue for School. Erik's transcripts, student loans. Purple for Automobiles. Insurance, registration, payments. Pink for our Phone Provider. Bills, contract. Black for Retirement. Statements, terms. Hopefully this gives you your own ideas for organization. Right now is the perfect time to stock up on office items! 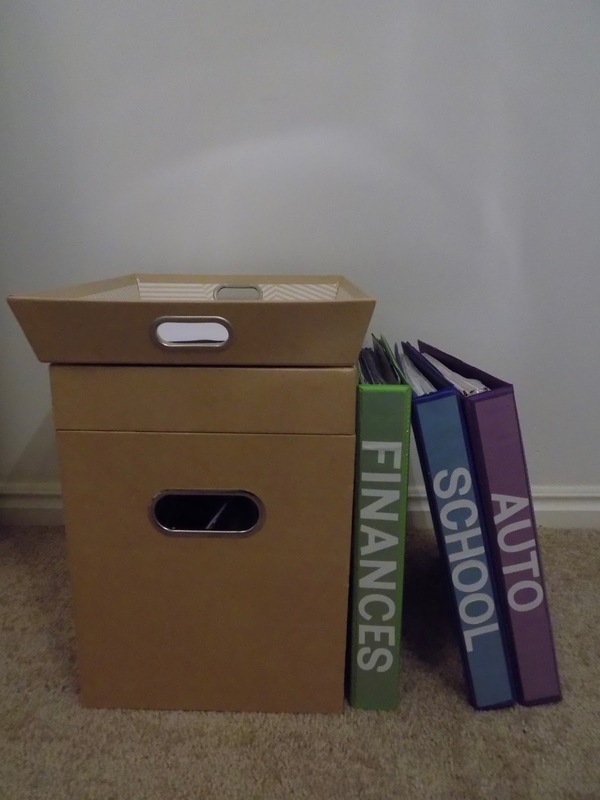 How do you keep your papers organized?